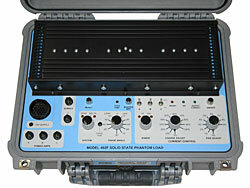 Portable and workshop phantom loads with both voltage and high current outputs. The Model 462F is designed for use with any field test set for testing polyphase CT meters. It can be powered from the metering test block, and will test nominal 240V, 3 phase, 4 wire star connected L.V. meters or nominal 63.5V star connected H.V. meters. It can also test nominal 110V, 3 phase, 3 wire delta connected meters. 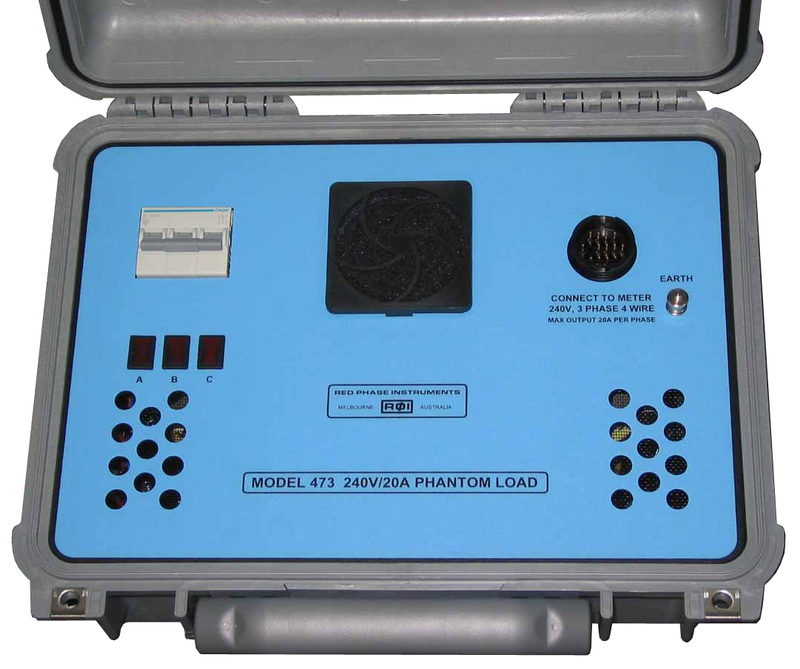 This phantom load can be used with the Red Phase Instruments Model 679 and 679B polyphase meter testers, or any other meter tester. The 3 current outputs are variable from 0 to 100% in 1A and 10 A ranges in coarse (10%) and fine (1%) increments. Phase angle/power factor settings are available from 60º LEAD to 90º LAG in 15º increments. connected Energy meters during commissioning or routine testing. The 467B-30 can deliver over 100VA per phase at 100Amps / 1V. 4 wire and this is protected with a 3 pole circuit breaker. Simple and easy to use 3 phase phantom load used in pre or post commissioning of metering and / or measurement products. Supplied cable accessory is 4 metres long and is capable of providing 7.5 to 8 Amps of load current. With shorter and thicker gauge cabling the 473 is capable of providing up to 20 Amps of load current per phase. 3 phase 10A circuit breaker used to protect the unit. Output configuration is switchable from star to delta. 3 phase, 4wire star 240V / 415V nominal. Maximum out is 0.7A, 160VA. The output voltage is controlled by 3 "Variacs", and is adjustable from 0-110%. The output is not isolated from the mains supply. 3 phase, 3 wire delta 110V nominal. In this configuration the output from the 472 is isolated from the mains supply. The N terminal is earthed to chassis and mains earth. The output of VA and VC terminals is 110V nominal with respect to the N terminal. The output voltage is controlled by 2 "Variacs" and is adjustable. Copyright © 2008 Red Phase Instruments. All rights reserved.